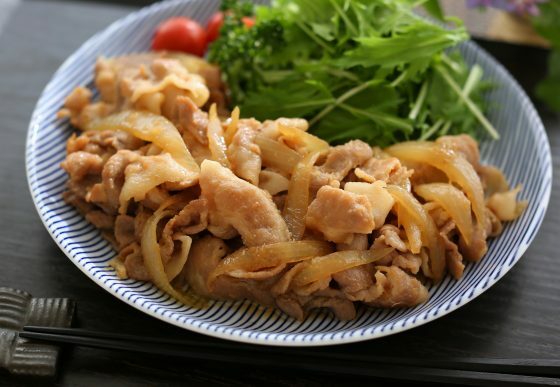 Today I will introduce you to a particular recipe for a popular Japanese home dish, pork stir fry with ginger. 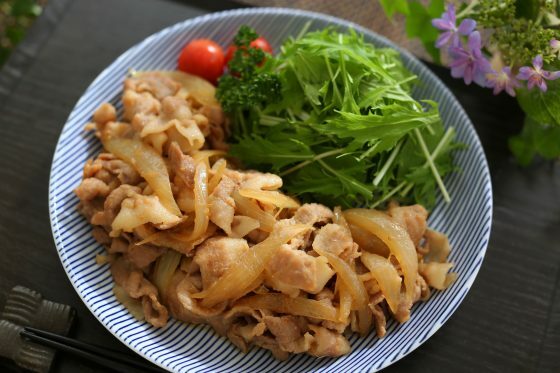 Chef Kimio Nonaga, owner of Nihonbashi Yukari, a long standing Japanese restaurant established in 1935, was the creator of this recipe: a pork stir fry that doesn’t need oil. When making a regular pork stir fry, the meat is cooked first, and then the seasoning is added. However, for our recipe, the seasoning and pork are mixed from the beginning and cooked together, without using any oil. If cooked with beer, the meat will have a mild, mellow texture. This dish only takes about six minutes to prepare. Here’s the recipe for the zero-oil pork stir fry with ginger. 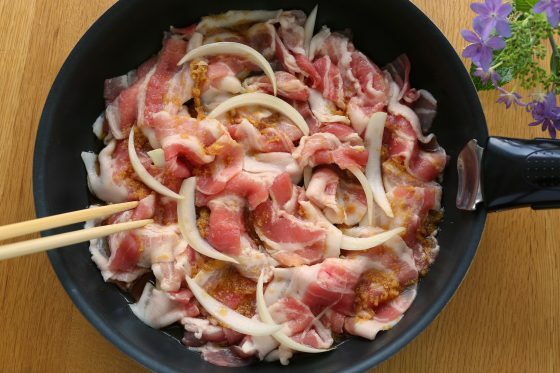 Cut the pork into bite-size pieces and the onion into 1cm thick wedges. Put the pork, onion and ingredients listed on (A) in a frying pan. Stir well and cook at medium heat. Keep cooking until there is barely any juice left. The first one is using beer. This dish is usually cooked with sake, but beer makes the meat softer and gives it an appealing flavor. The second point is heat timing. The trick is to put the pork, onion and seasoning in the frying pan and mix them while still cold and raw (as shown in the photograph above), then heat the frying pan. By slowly raising the temperature, the meat will remain tender and juicy. The result will be a dish with a mild, delicate taste. By following this recipe, you are guaranteed the pork will have a soft and plump texture. No more tough and hard to chew meat!